NOW I login back to my swap-bot account, and there's a 1 rating from her out of nowhere! BLARDY HELL?! even if it's a mix-up/error/misunderstanding it's just a darn postcard and she didn't even have the courtesy to inform me anything! That just shows how insensitive and selfish some people can be to go RATE u 1 thinking you're stupid. GOODBYE SWAP-BOT! I RATHER SPEND MY MONEY & EFFORT IN RUMMAGING THROUGH WAREHOUSESALES! 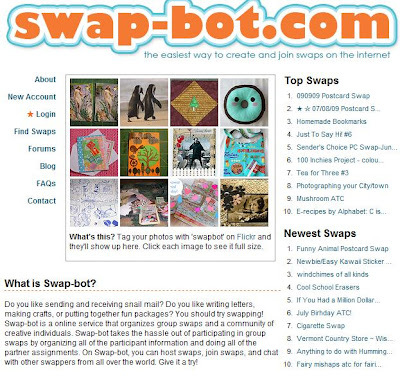 I've never heard about swap-bot until i started reading your blog in April. Yeah I agree with you, international shipping just aint worth it! As a noob in MUA, it kinda pissed me off when some "seniors" act snobbish. But not all, of course. Some are really nice. But I guess I'm done with it. V_V I think it's so much better (and safer) to swap stuff with ppl I've known, rather than with some random foreigners. swap oversea? umm.. no try swap oversea.. hehe.. my first swap is with janice! this site you mention I no see before. Sherry: will cost u a $$ n the swappers don't really care about us much.